The HELP World Mental Health Day (WMHD) is an annual campaign jointly organised by the Psychology Department of HELP University and the Malaysian Psychiatric Association. WMHD 2013 would be the follow-up event after the successful kick-off of the WMHD 2012 event last year. This year, the campaign themed 'addiction', aims to break through the current mindset of the society about the importance of curbing the potential harm and effects of addiction. Also, this campaign aims to educate the public on what addiction is about, the potential harm that it causes and what can be done for prevention and cure. All these are done through various promotional methods such as flash mobs, road shows, freezemob, information sharing via social media, NGO events, sponsors' websites, radio station appearances and newspaper coverage. This campaign focuses on creating awareness through main highlights of the campaign, which consists of many different interactive activities carnival exhibition and stage play. The addictions targeted in this campaign are alcohol addiction, drug addiction, smoking addiction, gambling addiction, work addiction, and technology addiction. Mission: To advocate mental health awareness through education. Vision: To destigmatize the public about mental health issues. 1) Enlighten the public about what addiction actually is. 2) Understand how addiction may be harmful to ourselves and people around us. 3) Encourage people who are suffering from addiction to seek professional help. 4) Educate people on the proper addiction prevention methods. Malaysia is said to be the 10th largest consumer of alcohol in the world. Additional data from the World Health Organization suggests that 35% of non-Muslims who do drink alcohol overindulge. 45% of Malaysian youths under 18 were also found to be consuming alcohol regularly while 25% of alcoholics show below average in work performance. The National Drug Agency (ADK) has registered more than 300,000 drug addicts in its drug fight, however this amount is just the tip of the iceberg. Local studies have suggested that 3 out of 4 drug addicts are not registered with the ADK, hence it's just an estimated number and the actual amount can be quite staggering. Drug addiction is a threat to the lives of young people; those who become addicted to drugs will be limiting their future possibilities in life. It is also not possible to perform well in school or college while abusing drugs. Smoking is considered one of the most commonly seen forms of addiction around. Data has shown that cigarette users are 28% more likely to develop dependency compared to users of alcohol, cannabis or cocaine. Also, nicotine addiction requires long term intervention and relapse is common in most cases of quitting attempts. Reports have shown that 77 illegal dens were clamped down by officials within a short period of 5 months. The officials have also reported that they had conducted 148 inspections in gambling centers in that period of time. Apart from the 77 dens, they had also requested the local electric company to stop supplying electricity to the illegal gambling dens. With all the recent events, it was also reported that there are at least 1435 illegal gambling dens found operating in Selangor. With so many illegal gambling dens found in Selangor, it can be seen that gambling is slowly becoming a frequent activity among the society. BBC reports suggest that Malaysians are the heaviest users of social network sites, spending an average of 8 hours a week on these sites. The study also discovered that users are spending more time using social network sites compared to the conventional email method of e-communication. This is partly caused by the rise in mobile Internet access among society. A recent study also concluded that Facebook addiction amongst university students is prominent in Malaysia, this is especially common among females. This trend of technology addiction is slowly turning prevalent and worrisome in today's society as not many people realize that they are actually hooked to such an odd and surreal concept. According to Expedia's 2012 Vacation Deprivation Survey, Malaysia has the world's 4th most dedicated workforce, with 90% of the workforce working even when they are on holiday. It was also found that 40% of the respondents in the survey were not willing to take leave because of fears that supervisors would not like it and 15% were concerned that taking leaves would reflect negatively on their careers. These employees who seem to be unable to "let go" of their work during vacations are also known as workaholics. Even the smallest amount of contribution would make a difference in making a difference in the lives of those in need. We sincerely thank you for your time and attention. Your support is truly appreciated! 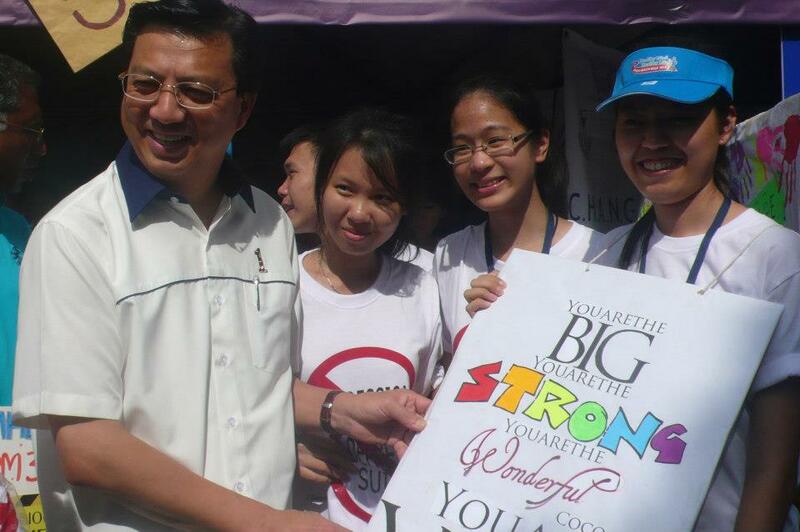 The previous campaign (WMHD 2012) garnered considerable attention from the Ministry of Health of Malaysia, celebrities and the media. Below are news coverage and pictures of the event last year on our collaborative participation with the Malaysia Mental Health Association (MMHA) at Taman Tasek Permaisuri. However, the person must send pitchIN the proof of transfer by attaching the receipt to the email address: [email protected] with the Subject Heading: HELP MENTAL HEALTH. Upon receiving that, the folks at pitchIN can then quickly update the project page. Thank you for your support. You are now entitled to own 5 World Mental Health Day (WMHD) wristbands. Thank you for your support. You are now entitled to own 5 WMHD wristbands, 5 WMHD badges and 1 WMHD T-shirt. Thank you for your support. You are now entitled to own 10 WMHD wristbands, 10 WMHD badges and 3 WMHD T-shirts. Thank you for your support. You are now entitled to own 15 WMHD wristbands, 15 WMHD badges and 5 WMHD T-shirts.